The Polo Bar at The Westbury is a stylish, chic and luxurious bar, adorned with Swarovski Crystal fittings and custom Fendi detailing, located at The Westbury Mayfair, a Luxury Collection Hotel, London. Its favourable location close to London’s fashion and shopping district is a major plus point, as is its attentive and immaculate service, gorgeous interiors, fabulous ambience and its incredible extensive cocktail list. London has certainly been in bloom this summer, and The Polo Bar at The Westbury has been right on trend with its special exclusive trio of cocktails called The Season of Flowers. I was invited to experience these beautiful cocktails with some of my fabulous blogger friends, courtesy of The Polo Bar at The Westbury. These special cocktails are vibrant and celebrate the the essence of various captivating and colourful flowers and I was really excited to try them. A big thanks to Angie, Emma, Lauren, Geeta, Priyam and Bejal for such a fabulous evening. Throughout the evening we had a chance to try all three of the cocktails, which are a Gem Marigold, which is an exquisite balance of Gin, Campari, freshly squeezed pomegranate and delicate pineapple foam, Viola Mule, which is a floral twist on the classic Moscow Mule with a Vodka infused Blue Pea flower creating a botanical aroma complementing the zesty base and highlighting the spicy ginger finish, and the Dianthus, which is a Dark rum balanced with rosebud tea and peach creating a reflection of the Dianthus. The best part about The Polo Bar are that some of the cocktails are served with a miniature version alongside it, solving that age old problem of drink order envy or simply to curb any curiosity of how your drinking companion’s cocktail tastes! My favourite of all the cocktails was definitely the citrusy and zesty Gem Marigold but I loved the presentation of all three, especially the Viola Mule. The attention to detail in the cocktails was fantastic and they were each like a work of art! Alongside our delicious cocktails, we were treated to some wonderful canapés from Michelin Starred Alyn Williams at The Westbury Hotel, which I had visited a few months ago for a Michelin Starred Supper Club. As always the food was absolutely delicious and such a lovely treat, and I especially loved the choux pastry nibbles filled with cheese – divine! If you’re looking for a lovely venue for cocktails, The Polo Bar is superb and with its lush interiors, delicious cocktails and fantastic service it is definitely a gem in the heart of Mayfair. 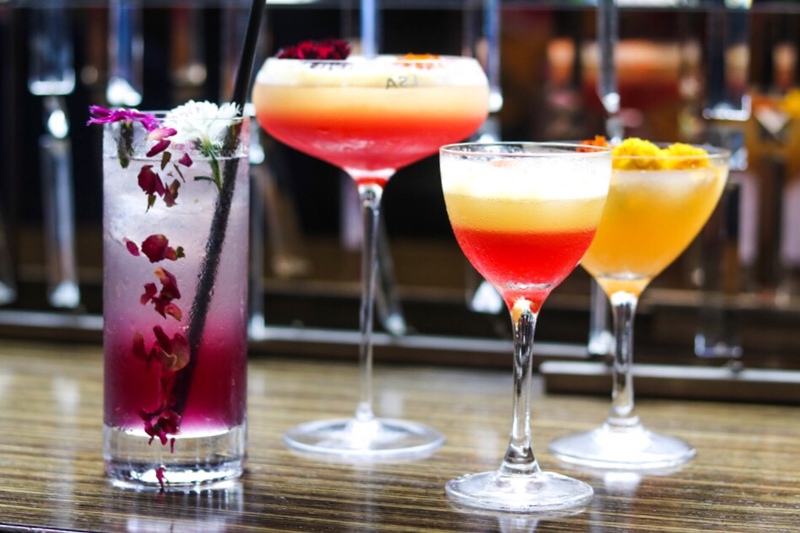 The Season of Flowers range of cocktails are decadent and stunning, and so if you get a chance do visit to try them! As we left we were presented with a lovely bouquet of flowers each which was such a lovely gesture! A big thanks to The Westbury Mayfair for hosting us and for such a wonderful evening and we will definitely be back again soon. We were guests of The Polo Bar, The Westbury Mayfair but all views and photos are my own. Beautiful Post, beautiful cocktails, beautiful company! It was an incredible evening and my fave was the Viola Mule! This was SUCH a fun evening! That Viola Mule gave me all the heart-eyes! I love the idea of the smaller version alongside the big version so others can sample it. And that photo of you at the top is fabulous!